The art of photography is not as easy as one might think. There are many aspects, elements, components, etc. that one has to learn in order to produce high-quality images. Aside from that, there are quite a few various types of photography that need to be learned and understood in order to find his or her specialty. In that case, taking courses, seminars, workshops, etc. will help in enhancing the talent and skills one has in photography. 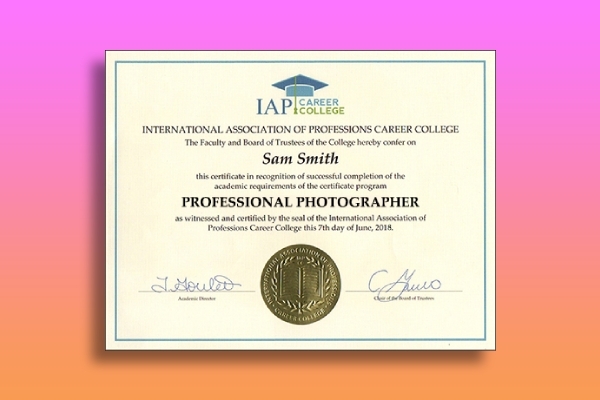 In this article, various downloadable photography certificate templates and examples are provided to give to course completers. Before a person can claim that he or she is a professionally trained photographer, he or she needs to provide legitimate proof. One proof that can be given is a certificate stating that the person has completed photography training. 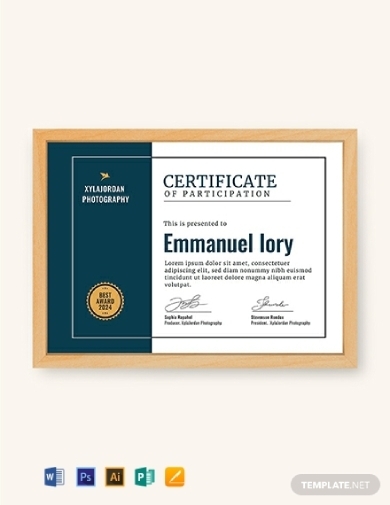 Should you be the one to organize such an event, you can give your participants this editable photography participation certificate template. You can easily edit this template to incorporate your design ideas and preference. 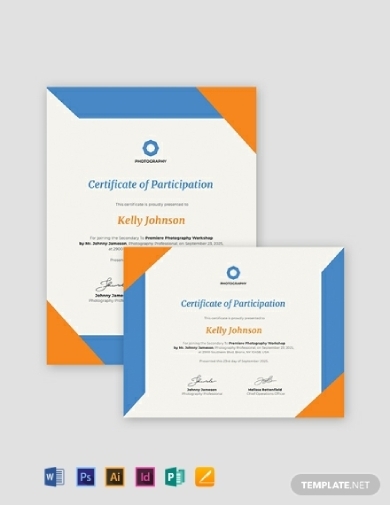 Similar to the first template, this template can be used when there is a need to give participants a certificate. This will state that the participant has successfully completed the required hours for the photography training or workshop. You can easily download and edit this template to provide actual information. This template is available in Adobe Illustrator, InDesign and Photoshop, MS Word and Publisher, and Apple Pages format. Since photography is still a form of art, all materials used for a photography training, seminar, or workshop should exhibit creativity. The certificate you give to the participants should be simple, creative, and effective. Regardless of the design and layout, it is important to ensure the included information are still readable. For that, you can download this creative photography participation certificate template to get a head start in the creation process. As they say, simplicity is the ultimate sophistication. 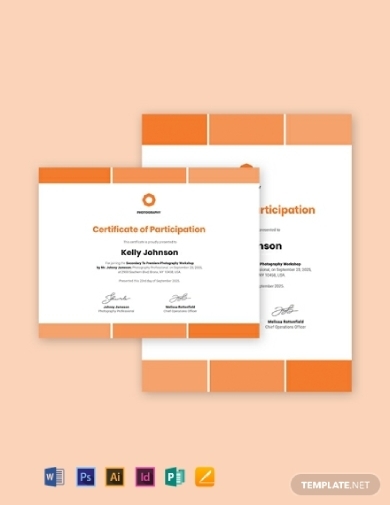 Hence, using a simple layout and design with the participation certificate is acceptable. If you are looking for a simple but captivating photography participation certificate template, this one is perfect for you. You can change the colors of the borders, edit the design and content, tweak the layout, etc. of this template. Looking for a classic layout for a photography participation certificate? We have the perfect template for you! This template uses two basic colors that you can easily change, simple borders, easily readable font styles, and a clear format that will allow you to provide all the necessary information about the training or workshop you have organized. You can download this template for free and edit in Adobe Illustrator and Photoshop, MS Word and Publisher, and Apple Pages. Aside from participation or completion certificates, a common certificate that a person can receive and use is a gift certificate. 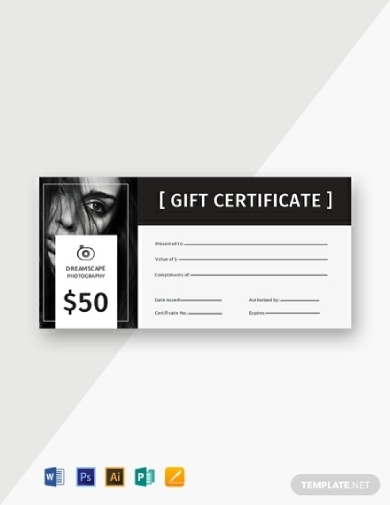 This photography gift certificate template is a good base that will allow you to easily edit and incorporate the necessary details along with your brand identity, style, and preference. Download this gift certificate for free from this article. Photography is a common course that a lot of colleges and universities offer. For a person that has an interest in the art of photography, it is apparent that they take the course. Once the student successfully completes the course, he or she will be given a certificate stating that he or she has legitimately completed the requirements for the course. As you can see in the example above, its layout is similar to a school diploma and has all the necessary details about the school and the course. In this example, you can easily see how much detail is provided to certify that the person has, in fact, finished the course of photography. 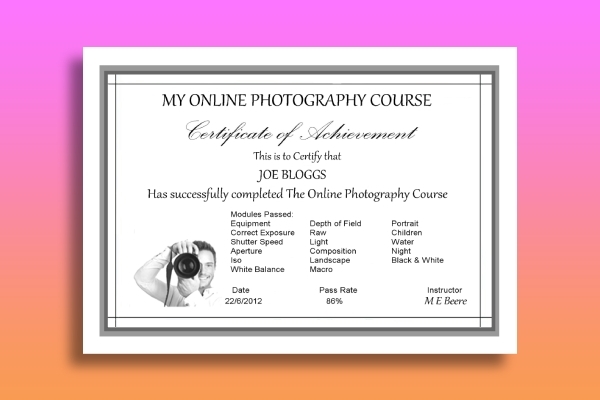 This certificate can then be used as proof that the person has earned the degree or title for photography. The layout of the certificate is simple and straightforward, the only evident graphic elements are the borders, school logo, and seal. Unlike all the other templates and examples that are all for participation and/or completion of a photography course or training, this is an example of a photography awards certificate. As you can see, the award is specifically for monochrome photography, which means capturing images in black and white. 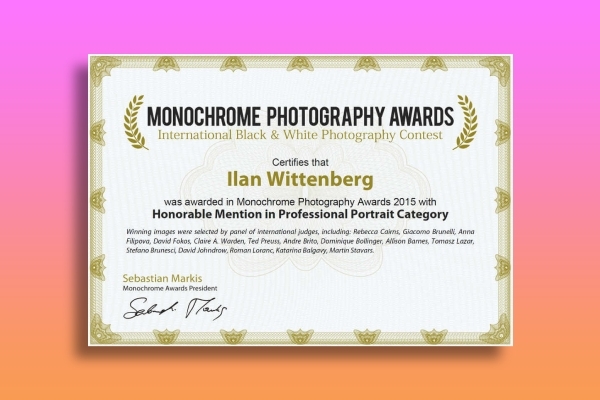 This certificate was used to give recognition to the photographer who has shown great skill in monochromatic photography. After a student completes and finishes all the required subjects and outputs for a photography training he or she is given a certificate. 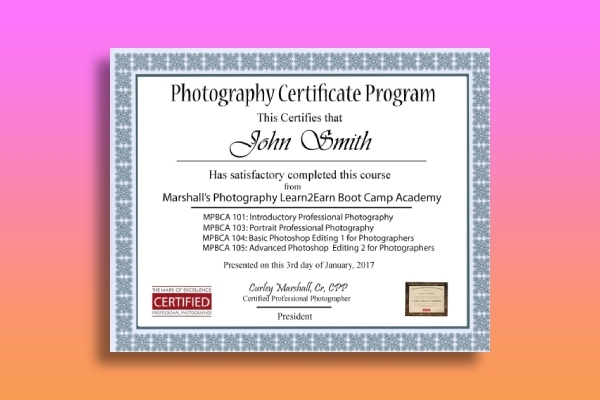 This completion certificate example is specifically created for people who have completed the course in photography boot camp academy. The certificate lists all the courses or subjects the student has completed along with the certifying phrase that he/she has satisfactorily completed the course. Unlike all other courses that you have to take in actual classes, there are also courses that are offered online. Just like in this example, a certificate of achievement is given to a student after he or she completes the online photography course. 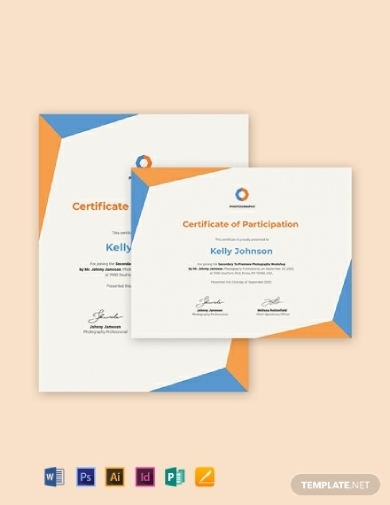 The certificate lists all the module the student has passed along with his or her passing rate, the name of the instructor, and date of completion. The certificate only uses minimal design elements such as the borders and image relating to the course. Photography can be an innate talent that a person can have, but taking necessary measures to improve it will always be helpful. If you are the person on the other end of the equation, giving students a good overall learning experience should be the priority. The certificate templates we have provided are all downloadable and easily editable. We hope that you find all the templates that we have provided in this article as useful and insightful.